OCast morcón (fr mondongo), morsilla, morzilla, muresillo, musçilaginosa, OCat murcies (a stuffing), Leon morciella, Ar. mirkás (merguez sausage made with meat from a lamb’s leg or shoulder and murri naqi’ instead of blood), Port. morcella, Eng. 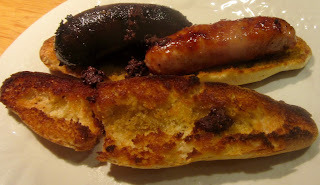 blood sausage or black pudding. Basically, it consists of blood (collected when the pig’s throat or aorta is slit), seasoned pork from the belly or the meat between the shoulder and the elbow, fat from the chin and caul. 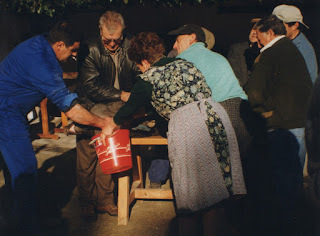 The Leonese add onion, while those from Burgos use rice. In León, it can consist of blood and cured lamb suet. Each region and household has its particular recipe. Some priests, beside Pablo Santa María, 1350-1435 (a Jew who converted to Christianity), thought that Genesis IX: iii-iv, prohibited consumption of animals’ blood and they believed that it caused melancholy and illnesses. They even forbid Maragato cocido (boiled stew) as “heretical food” as it contains blood sausage. Carvers, after slicing meat, let the blood run out to prevent offending any guests. Others, like Baltasar de Alcazar, author of “Cena jocose” (jocular dinner), sang his praises for this sausage. Immediately, upon killing the pig, a woman, holding a pail, jumps in front of the pig to catch the blood spurting out of the gash. After a bit, another woman replaces her with another bucket. The first one quickly stirs what is in her bucket with a stick. Then she goes back to the pig while the second woman stirs the blood in her pail. They alternate in that fashion until the pig stops bleeding and the blood has been stirred sufficiently to prevent coagulation. In Estremadura, salt is not added, but in León it is. Sheep’s blood does not coagulate. A pan is set under its chin while the slaughter man works on preparing other parts of the body after the kill. See morciellas and mondonga. No recipe is needed for the simplicity of preparing sausage. Normally it is fried. In Valencia there are side walk stands surrounded by tables for customers ordering their specialty of “blanco y nergros,” i.e. one white sausage fried with one blood sausage served in a bread roll. Nothing can be more delicious!